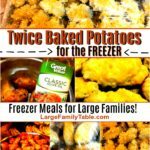 Enjoy Twice Baked Potatoes for the freezer as a side dish for large family meals or even for a meal themselves! Place filled potatoes on parchment paper on a baking sheet. Put the pans in the freezer for up to two hours to flash freeze. You can see in my picture below how I layered my potatoes on large metal pans. After you flash freeze wrap each potato in plastic wrap and fill gallon size freezer bags. We filled at least 10-gallon size bags of Twice Baked Potatoes! Set out a bag from the freezer into the refrigerator to completely defrost.